Home remedies for chafing can come in handy when irritations arise. Knowing beforehand how to treat them empowers a person to know what to do as soon as they are confronted with this annoying condition. However, knowing how to prevent chafing is best, which involves understanding what chafing is and what causes it so that it can be avoided. Chafing is a rash or skin irritation caused by a constant rubbing or friction at the skin’s surface. Any of the above herbs can be used singularly or combined to make a tea and applied directly to the chafed site for fast relief and to initiate the healing process. After applying any of these methods, it is important for the skin to be thoroughly dried. If skin does become infected, it should be regularly and gently cleaned with warm water and a clear, anti-bacterial soap before loosely wrapped in gauze or a bandage to keep outside pollutants away from the irritated area. People who have a history of chafing should also increase their intake of foods rich in magnesium, zinc, Vitamin A and Vitamin C.
If obesity is the cause of chafing, a serious, natural weight loss regimen that includes daily exercise can not only reduce the incidences of chafing, but can greatly improve one’s quality of health overall. During the interim, one of the best home remedies for chafing involves prevention by applying cornstarch to chafing zones or applying petroleum jelly to chafing areas before exercising. Natural cures for chafing are important to use as soon as an irritation is present. 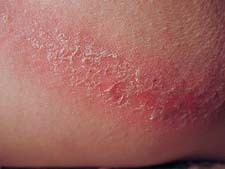 Chafed skin is more prone to infection by bacteria, fungi or viruses that it may come in contact with. Though it is not a serious condition, if it is not treated in a timely fashion, chafing can lead to greater problems. Home remedies for chafing are safe, inexpensive and very effective in both preventing its onset and in treating chafed skin at the earliest sign of symptoms.